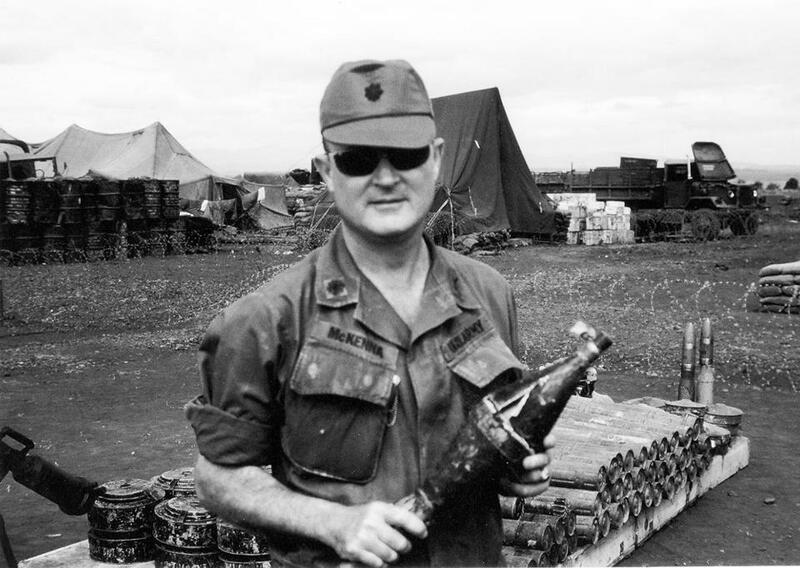 Thomas P. McKenna holding a rocket-propelled grenade warhead captured in 1971 in Vietnam. A book about the Battle of Kontum that takes issue with Stanley Karnow’s description of the battle in his Pulitzer Prize-winning history of the Vietnam War has won the 2013 William E. Colby Award. “Kontum: The Battle to Save South Vietnam” (University Press of Kentucky) was written by Thomas P. McKenna, a retired US Army lieutenant colonel who was one of a handful of American advisers in Kontum in 1972. Named for William E. Colby, the late ambassador and former CIA director, the award recognizes a first work of fiction or nonfiction that significantly contributes to the public’s understanding of intelligence operations, military history, or international affairs. What actually happened was different. McKenna writes: “During the last two weeks of May in 1972, Kontum was the scene of a violent struggle between the equivalent of three divisions of Communist North Vietnamese soldiers, who were attacking to seize the city, and the one South Vietnamese division defending it. . . . The enemy held almost half of the town, and their troops and tanks were assaulting day and night to take the remainder of it.” Yet Kontum was successfully defended. Previous Colby Award winners include Dexter Filkins for “The Forever War” and James Bradley for “Flags of Our Fathers.” The award, which carries a $5,000 honorarium, will be presented to McKenna on April 11 at Norwich University in Vermont. San Francisco-based bookseller Beau Beausoleil will be in Cambridge this week to discuss an anthology he co-edited, “Al-Mutanabbi Street Starts Here: Poets and Writers Respond to the March 5th, 2007, Bombing of Baghdad’s ‘Street of Booksellers.’ ” He and London-based Iraqi filmmaker Maysoon Pachachi will read from it and discuss the project at 6 p.m. Monday at the Cambridge Arts Council Gallery, 344 Broadway. An exhibit of artists’ books created to honor the freethinking spirit of Al-Mutanabbi Street is on display in the gallery through June 21. Pachachi will screen her documentary “Our Feelings Took the Pictures: Open Shutters Iraq” at 6 p.m. Tuesday at Cambridge Public Library, 449 Broadway. The film follows a group of Iraqi women who document their lives through photography. A talk by Pachachi and Beausoleil will follow the screening. For more details, visit www.cambridgeartscouncil.org. Jan Gardner can be reached at JanLGardner@yahoo.com. Follow her on Twitter @JanLGardner.